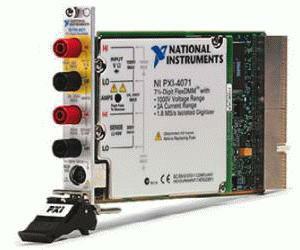 The NI PXI-4071 is a 7½-digit FlexDMM - a high-performance, multifunction 3U PXI module that provides the measurement capability found in two common test instruments, a high-resolution digital multimeter and a digitizer. As a digital multimeter, the NI PXI-4071 delivers fast, accurate voltage measurements from ±10 nV to 1000 V, current measurements from ±1 pA to 3 A, and resistance measurements from 10 µO to 5 GO, as well as takes frequency/period and diode measurements. In the high-voltage, isolated digitizer mode, the PXI-4071 can acquire waveforms at sampling rates up to 1.8 MS/s. Using the analysis functions in NI LabVIEW, you can analyze these waveforms in both the time and frequency domains. The PXI-4071 offers the superior speed, accuracy, and functionality necessary on both the production floor and in R&D. Use the PXI-4071 with PXI switches to form a multichannel, high-voltage data acquisition system. You can combine the NI PXI-2584 12-channel, 600 V multiplexer with the PXI-4071 to test fuel cells or battery stacks at up to 500 VDC common-mode isolation. The NI PXI-2527 64-channel, 300 V multiplexer offers a higher-channel-count solution for lower-voltage, high-accuracy measurements. To see more switch configurations, see PXI Switches on the Resources tab. The NI PXI-4022 is an accessory module consisting of a high-speed, high-precision amplifier that conditions signals for acquisition. With the guarding functionality, you can make 6-wire resistance measurements for resistors connected in parallel on complex printed circuit board. For low-current measurements, the NI PXI-4022 amplifier and high-precision resistors create a feedback current amplifier. This minimizes burden voltages and converts current to voltage, so you can measure picoampere signals with femtoampere noise.